Accident Free Days Signs track your safely worked days. If you are looking for an accident free days sign, you've come to the right place. We specialize in providing unique safety metric tracking signs built to order according to your needs. Our proofing process ensures you know exactly what your sign will look like before we build it. Accident Free Days Signs Designed for you. Add any number of graphics to your sign. Whether you are just looking to add your company logo in the corner of the sign, or add a picture of your plant as the background we have you covered. Our online designer lets you modify existing designs to suit your needs, or if you would prefer we create a design for you from scratch just shoot us an email. Stock Accident Free Days Signs become Custom Signs: No Up Charge! We have many stock designs in common sizes to choose from. You’re free to order any of our stock designs but why settle for a generic sign when you can make it your own and showcase your brand for no extra cost. We never charge anything extra to add your logos, graphics, or custom text. If you are looking to track days since an accident our four digit counters are available in 2.3” and 5” versions. They operate independently so one can be counting up while another is held static or counting down, but they can all be controlled with a single IR remote. If you’re looking to really grab some attention take a look at our safety scoreboards with integrated stop lights. 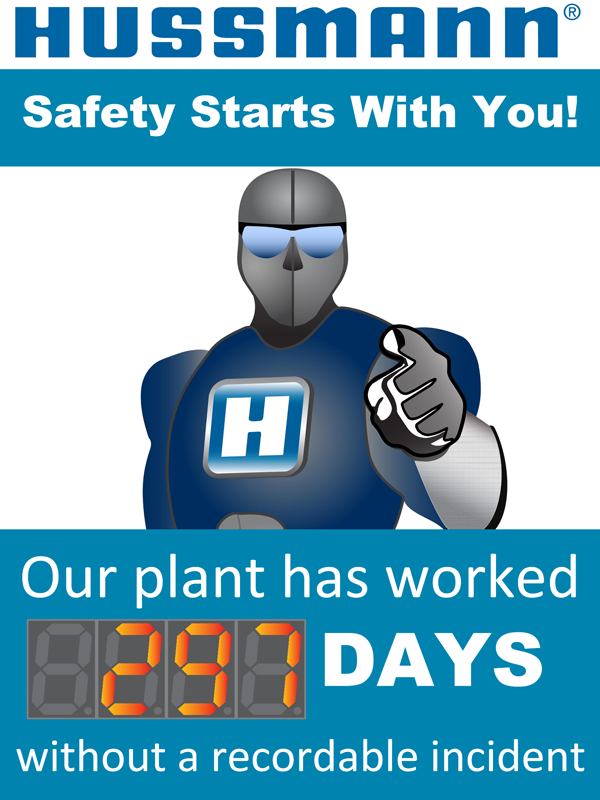 Or showcase your regular safety slogans or team updates on a sign with an integrated scrolling message center. If you are looking to track accident free days for multiple teams or departments, you’re really in our wheel house. One of the great advantages with ordering your safety scoreboard from us is that we can add any number of displays to your sign. We are not limited by a set layout so your displays can be positioned anywhere on the sign that makes sense for your particular design. Our online catalog showcases the most common sizes for scoreboards ranging from 22”x28” in landscape or portrait orientations all the way up to 60”x36”. However, because we make signs to order we can create an even larger sign for you. Just email us with your requirements and let us know how we can help. 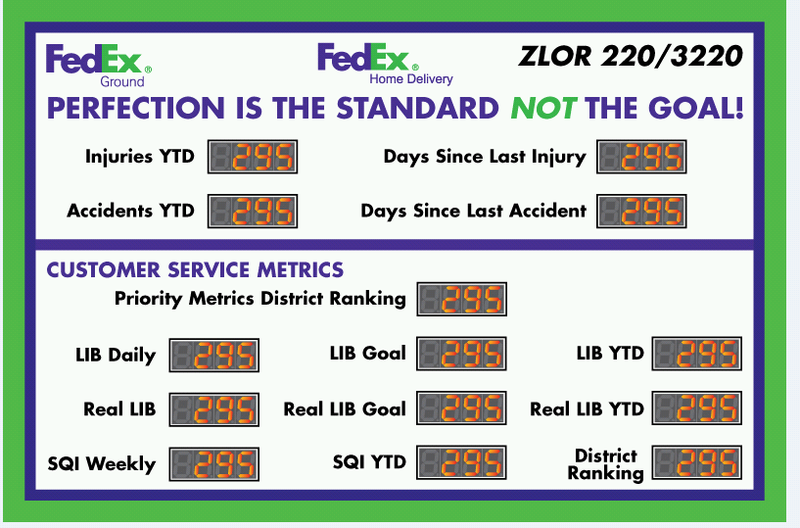 Here is an example of a really complex sign FedEx uses to track safety and service metrics. Look to Cousign for an accident free days signs to track your safely worked days.